When I moved to Austin, Texas from Greensboro, North Carolina, I quickly discovered the shortcomings of US Airways service for the city. The only flights in or out were on regional jets with no first class cabin and a not very comfortable ride. Wanting to make an informed decision, I consulted the Austin-Bergstrom Airport website. 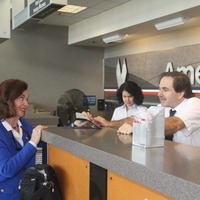 There I discovered that the airline, besides Southwest, with the most flights was American at 26 percent. (Now it’s less than 20 percent, but still only behind Southwest.) By the way, if you want these stats for your airport, you’ll find them at http://www.transtats.bts.gov/. Anyway, I called the airline and of course, they had their own version of a status-matching program. I matched to Platinum within two months; it took a year and a half to achieve Executive Platinum status. As an Executive Platinum on American, the benefits are excellent, including free unlimited upgrades on a space-available basis, free checked baggage up to 70 lbs. per piece, and boarding with First Class passengers, even when you don’t get the upgrade. But these benefits are not what keeps me coming back. It’s their people that make the difference! Yes, I know I’m nice to them, too. I call Marc, the ticket counter agent, Denay and Barbie, the women in the Admirals Club, and gate agents Cathy and Lisa by name. And yes, I do bring cookies or muffins to the flight attendants. However, even when I don’t, they are cordial and call me by name. The flight attendants go out of their way to make their road warriors like me feel taken care of. And even the folks on the phone seem to go the extra mile to help. Why did I really leave US Airways? That’s another story for another blog. Stay tuned. Posted by Joyce Gioia in Advice for Airlines, Advice for Business Travel.